NJDEP staff will be providing a comprehensive review of the 2018 Municipal Tonnage Grant application process. 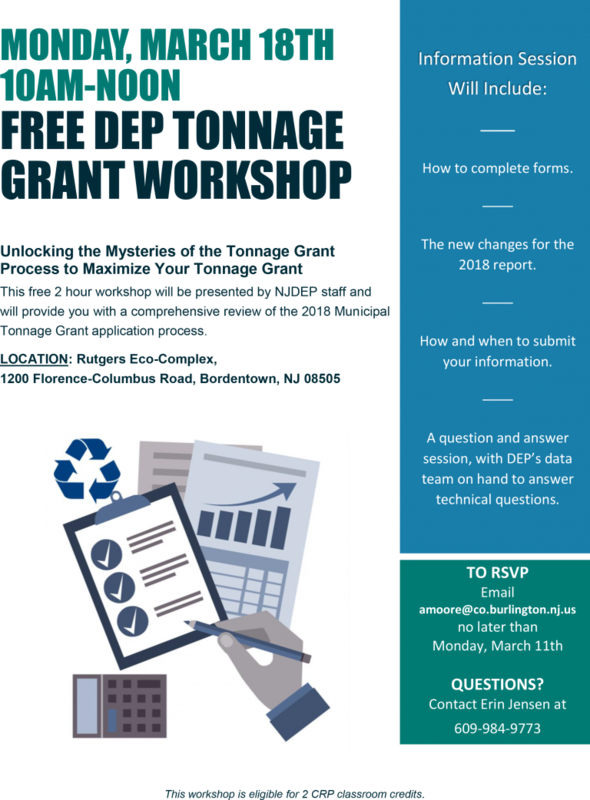 The two hour workshop is called “Unlocking the Mysteries of the Tonnage Grant Process to Maximize Your Tonnage Grant” and will take place Monday, March 18, 2019 from 10 a.m. to 12 p.m. at the Rutgers Eco-Complex. The new changes for the 2018 report. How and when to submit your information. A question and answer session, with DEP’s data team on hand to answer technical questions. To RSVP, Email [email protected] by Monday March 11, 2019. If you have any questions, contact Erin Jensen at (609) 984-9773.